A bicyclist rides at the intersection of Walnut Street Bridge and Frazier Avenue in this file photo. 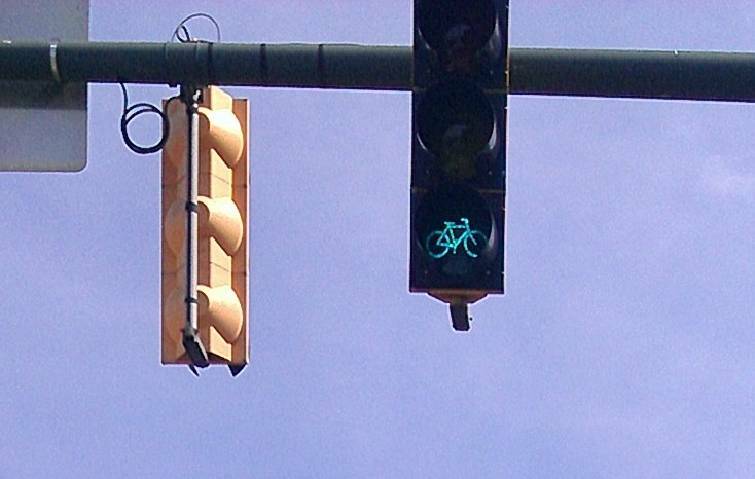 The city's first traffic signal for bicycles went into operation at the north end of the Walnut Street Bridge at Frazier Avenue. The city's first traffic signal for bicycles went into operation today at the north end of the Walnut Street Bridge at Frazier Avenue. The city transportation department said in a news release the signal uses traditional red, yellow and green indicators but they're shaped like bicycles to alert riders to follow them. Riders who stop over a sensor at the end of the bridge will trigger a green light that will allow them to safely cross or turn, the release said.